- Proven, systematic, erroneous speed readings in Baltimore. This included examples of stationary cars getting tickets, trucks accused of moving twice their actual speed, an admission from Xerox that their cameras produced "radar effects" (that's how they say "error" without using the word "error"), and a "secret" audit showing error rates of up to ten percent.... adding up to tens of thousands of false accusations. And all from cameras which passed calibration tests which are supposed to guarantee cameras are accurate. - An audit of the SHA's speed camera program showed that the state skimped on its own testing procedures, calibration practices, and procurement policies. - Local governments systematically circumvented an existing rule in the law designed to forbid the so called "bounty system": paying contractors based on the number of citations issued. Even Governor O'Malley has said this practice violates the original intent of state law. All these problems and much more. This was not "a few isolated problems"... it was widespread and systematic. People were calling for audits. They were calling for cameras to be required to provide "secondary evidence" to identify speed measurement errors. There were calls for outside oversight of local speed camera programs by the state. So this year the leadership in the state legislature resolved to pass "reform". And in a demonstration of true political snakishness the legislature did pass a bill... a bill which promised the world but actually did NONE of these things... and have now declared the system is "reformed". Right now the state lawmakers who voted for speed cameras in the first place are patting themselves on the backs for what they think has been a successful spin campaign to dupe the public into believing that the so called speed camera reform act has fixed these gaping problems. We have explained in the past why this change to the law amounts to little more than "Polishing Poop" and won't really change anything. Yet given that the supporters of speed cameras are currently conducting a massive media campaign to con the public, it bears repeating why this legislation does not solve the actual problem. First, the supporters of the "Speed Camera Reform in Name Only Act of 2014" assert that the problem with Maryland's speed camera law was that local governments were not doing enough to monitor their contractors. In this they are almost half right. But the real problem is that nobody was monitoring municipal speed camera programs, or ensuring that the rules were enforced. Since everything is self enforced, why should they not break the rules, or bend them until they are meaningless? Efforts to change this situation and include audits, oversight by the state, or an audit-able trail in the form of "secondary evidence of speed" to root out errors, were never seriously considered by the leadership of the committee which conjured this bill. Second, lawmakers want the public to believe that this bill "ends the bounty system". The reality is that rumors of the death of the Bounty System have been greatly exaggerated, and today the overwhelming majority of speed camera contracts still pay vendors a cut of the ticket proceeds. One speed camera contractor has already boasted about signing NEW contract extensions which lock in existing "bounty system" contracts for years. In addition, one should not forget that the bounty system was never supposed to exist in the first place, and that the ORIGINAL speed camera law that was in place for years already contained language clearly intended to forbid the practice. We pointed out to the legislature a loophole in the language of the new law which may allow contractors to continue being paid based on the number of tickets so long as they don't explicitly use the words "per ticket" in their contract. The committee knows about it, and deliberately decided not to fix it. Montgomery County officials has been quoted by the Sentinel stating that the bill allows "hybrid leases", which would presumably not be truly flat fees. And one county has already devised a scheme to avoid "the bounty system" using semantics, which their vendor has claimed is completely equivalent to their old system. So there was an existing rule, and and existing promise, the clear intent of that rule has been consistently broken with semantic games by local governments across the whole state. Now they tell us "We've created a new rule which makes it all better and we promise to start complying with it... but not for another THREE YEARS." After the elections are long over. After most people have forgotten what was promised. If you believe that they are not going to engage in new legalistic semantic games to circumventing this rule and continuing to pay vendors a cut of the ticket revenues, then I have some ocean front property in North Dakota I'd like to sell you cheap. Other provisions of the new law are similarly loophole ridden or ineffective. But more importantly, they are all self-enforced. If a local government does not WANT to enforce them, they will go unenforced and there is nothing anyone on the outside of the program can do about it. 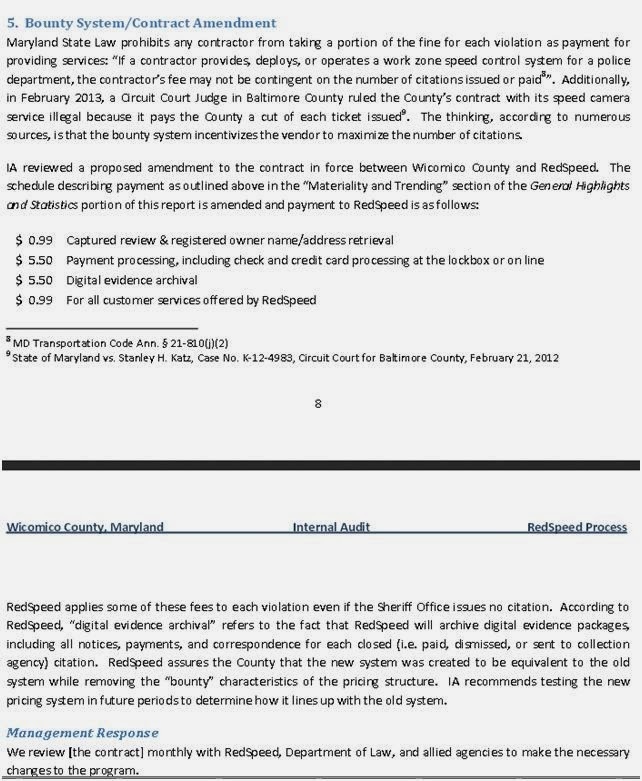 That was the original problem with Maryland's speed camera law, and since the state has willfully chosen not to provide outside oversight that has not changed. Finally, the supporters of this legislation want you to believe this bill represents some sort of "grand bargain" between speed camera supporters and opponents. That would be utterly false. The truth is that this bill was largely written by Montgomery County's speed camera program and by other local governments which run speed cameras (mostly though their representatives Maryland Association of Counties and the Maryland Municipal League). Montgomery County has boasted how they will see few changes with this bill, and how they "worked closely" with sponsors of the bill to ensure this would be the case. Local governments like Gaithersburg and Rockville each wrote "Protecting the Speed Camera Program" as part of their legislative agenda for the year, and in this they have declared success. There were alternative, stronger proposals for reform, and the true purpose of this bill was to PREVENT those proposals from passing, without lawmakers from needing to actually vote on them. And then the vice chairman of the Environmental Matters Committee, Delegate Malone, began the Feb 18th hearing on those bills by openly stating that no bills but his own would be considered. Malone even went so far as to follow this up in the Motor Vehicles Subcomittee hearing by stating that he didn't think people with complaints about speed cameras should bring them to the legislature. How is anyone to conclude that Malone, a key sponsor of the bill which just passed, actually cared about reform? Calls for audits were cut off. Reasonable amendments made by the Maryland Drivers Alliance specifically to protect the legal rights of motorists in small simple ways were never even considered. Opponents of speed cameras, and the press, were even banned from meetings where speed cameras were discussed by local governments. Supporting speed cameras was a price of a seat at the table, and when this bill was dumped on the floor the word to camera critics was "Take it because it's better than nothing." There was no serious debate this year... when the hearings opened the political establishment had already decided to pass the weakest bill they possibly could, "reform in name only" which would have no significant effect on most existing programs, and to pass absolutely no more. Indeed the bill does not even affect the State's own program AT ALL, since it does not apply to the separate statute which govern's the SHA's program. How serious could the state have been about reform if it exempted itself? The newly passed speed camera bill is just an election year ploy. Its purpose is to allow the lawmakers who voted for speed cameras to be able to claim they have "fixed" the law, and are assuming that the average motorist is too uninformed to realize the truth: that they are the ones who broke it and chose to keep it broken by ignoring stronger proposals for reform. They are assuming you are too gullible to look past it. If you're not falling for it, you can see your state lawmakers' real voting record on this issue here, and your state delegates can rightly be judged on how they voted on an amendment to repeal speed cameras.